County and state departments continue to assess storm damage impacts and have updated information on when some services will resume. SWIMMING POOLS OPEN SUNDAY: All swimming pools will open tomorrow, Sunday, August 26, with the exception of Lahaina Aquatics Center. Lahaina Aquatics Center will remain closed until further notice while repairs are made to the structures. COMMUNITY CENTERS/PAVILLIONS OPEN MONDAY: All community centers and pavilions will open on Monday, Aug. 27. WAIEHU GOLF COURSE: to be determined. RED CROSS SHELTERS: All of the County’s Red Cross-run storm evacuation shelters with the exception of Maui High School and Lahaina Civic Center have shut down. 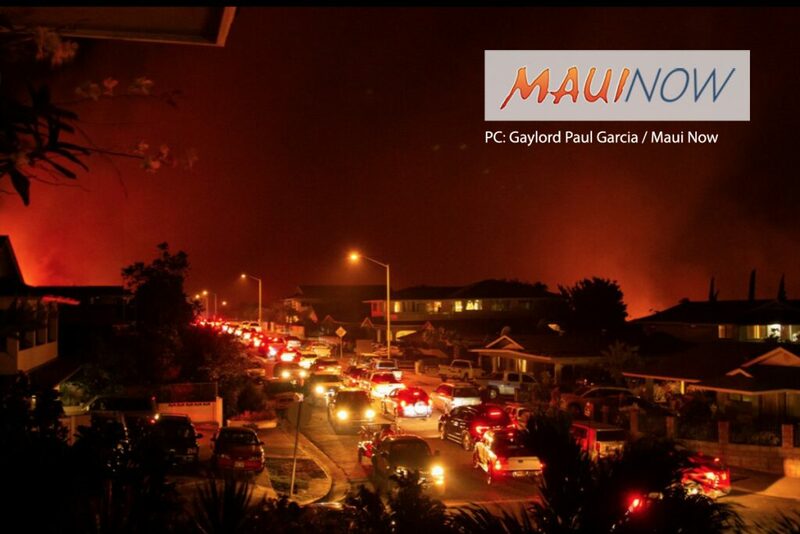 As of noon on Saturday, Maui High School has 21 evacuees and Lahaina Civic Center has 47 evacuees. Neither of the two remaining shelters is accepting donations at this time. * Kahekili Hwy: 6:30 p.m. 8.25.18: Kahekili Highway is now clear of a landslide that had covered both lanes at Mile 38. * Hāna Highway: 5:45 p.m. 8.25.18, Hāna Highway is clear. Motorists are asked to continue to use caution as the adjacent slopes are saturated. 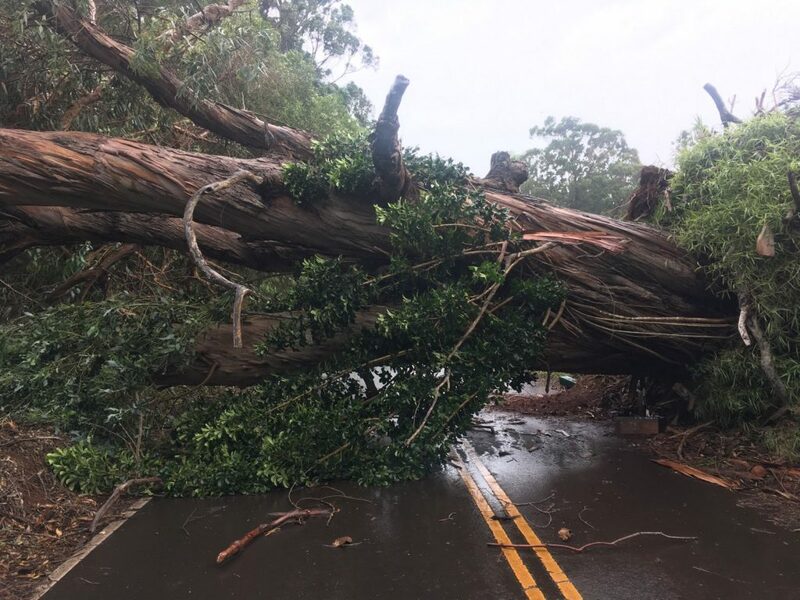 At 2 p.m. crews reported a large tree down on Hāna Highway at Mile 8 and multiple landslides. 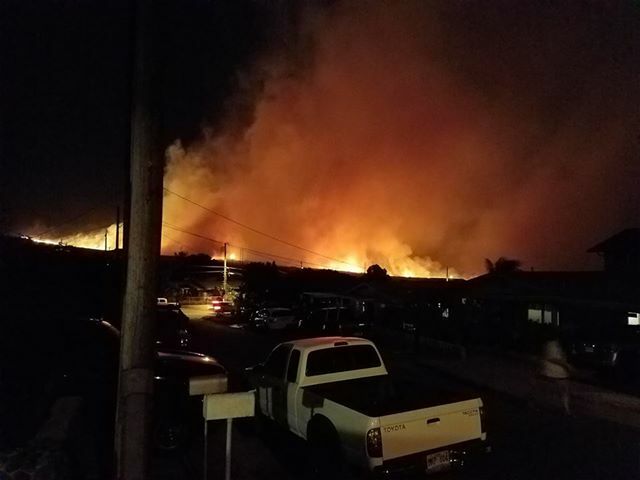 WEST MAUI FIRE UPDATE: While the Māʻalaea and Kāʻanapali fires have been fully contained, the Lahainaluna to Launiupoko fire is 80% contained. At the present time, Maui fire personnel are mopping up the Makai, Lahainaluna, Launiupoko flanks. The State DLNR Division of Forestry and Wildlife is working on the mauka flank in the Kuia area. 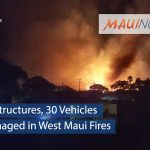 According to Battalion Chief Michael Werner, the initial damage assessment reports the following were impacted: 6 structures near Lahainaluna; 15 structures near Launiupoko area (including Punakea Loop, Hokiokio, Kauaula Valley); 1 baseyard with heavy equipment; and 30 vehicles. WATER SUPPLY: Department of Water Supply reports that its Lahaina Water Treatment Plant is now fully operational, and asks that West Maui residents conserve water today while Maui Electric works to get power restored. DWS also reports that additional water tankers are now located in Lahaina at 829 Kuialua Street and 849 Niheu Street. HARBORS: Kaumalapau Harbor on Lānaʻi as taken out of “Zulu” as of 11 a.m. HST on Saturday, Aug. 25. All commercial harbors in the State of Hawaiʻi have been returned to Hurricane Season Preparedness status, which means that normal operations can resume with caution.